We produce for Italy and abroad molds for valentine's day cake decoration. 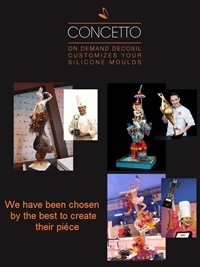 Italian leaders of silicone moulds, we create and sell for over 10 years molds for valentine's day cake decoration, food safe silicone moulds worldwide to confectioners, bakeries and Delicatessens. molds that can be used for casting or pressure colored sugar and isomalt transparent, pre-crystallized chocolate, ice cream, sugar paste, chocolate paste, marzipan and other masses of modeling sugar.